Video Conferencing Tools vs. Video Platforms — What’s The Difference? Video conferencing, web conferencing, unified communications — what were once distinct toolsets have in the past half-decade seen the lines that separate them blur. Traditionally, “video conferencing” implied a physical, often conference room-based video system using specialized technology that focused on face-to-face interaction. “Web conferencing,” meanwhile, referred to a less formal, desktop-and-webcam system that prioritized sharing on-screen content for presentations and webinars, with the presenter’s webcam video as an optional supporting element. Today, however, as many web conferencing tools offer two-way video and video conferencing tools add the ability to share content and present, the applications have become more similar and the nomenclature more interchangeable. Now whatever your tool, the resulting output is typically a video-based, real-time two-way interaction, emphasizing near-zero audio and video delay in order to allow for a conversation. What Does A Video Conferencing Tool Do? While the features vary and the technical aspects of each are different, the value delivered in a WebEx, a GoToMeeting, a Lync chat, an Adobe Connect session, or a meeting in the Cisco- or Polycom-equipped conference room is consistent — an instant audio, video, and screen-sharing connection with anyone located remotely. Fundamentally the value these tools offer is what the industry calls “synchronous communication,” or more simply, two or more connected video feeds that each update so quickly they can allow for real-time conversation between them. This makes video conferencing technology perfect for live, interactive meetings, but it limits the number of people who can tune in to the meeting, as we’ll discuss more later. Video conferencing technology makes it possible to meet with someone in another room, another building, or another country as if they were sitting on the other side of the table. And while it was the first application many organizations found for video, it’s now proving to be a gateway to using the technology for even greater ROI — which is where video platforms come in. 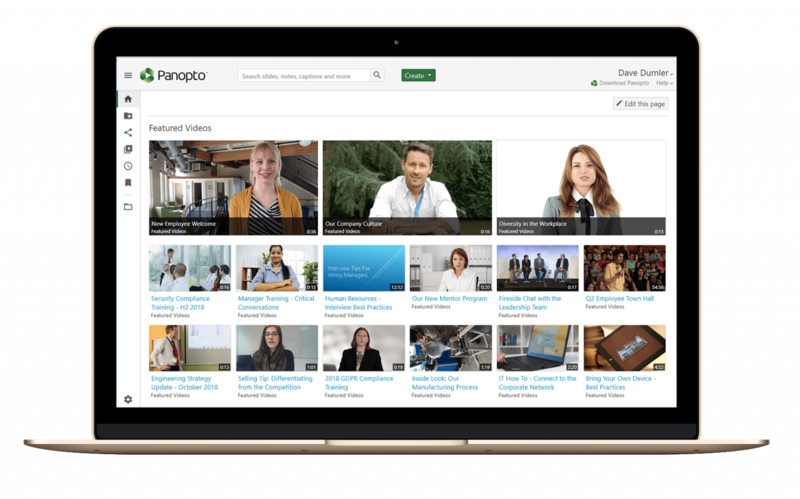 Whereas the conferencing tools are built for one task, video platforms have evolved as multipurpose technologies. Modern enterprise video platforms — sometimes called video libraries, video content management systems, or simply a “corporate YouTube” — are intended to support video production from end to end — recording, managing, searching, sharing, and viewing — enabling organizations to do more new things with video as well as get more value out of existing video. What Does A Video Platform Do? Along with these core features, you’ll find several others available depending on the solution. Some video platforms also offer live streaming features that enable you to broadcast live video. Others offer enhanced video experiences for mobile devices, with native apps and mobile-aware player design and video streaming. Unlike video conferencing tools, which are built for synchronous, two-way communication, video platforms are built for what the industry calls “asynchronous communication.” This simply means that video platforms can be used to stream video one-way to massive audiences, either live or on-demand. Fundamentally, these technologies are built for different communication scenarios — video conferencing tools excel at conversations among small groups, while video platforms excel at presentations to large audiences. While conferencing solutions and video platforms each offer their own subset of features and benefits, the technologies really begin to shine — and the use cases begin to multiply — when you leverage the two together. Where conference tools are weak — for example, in recording video for on-demand viewing, or managing and searching video content — modern video platforms offer the ability to record video from virtually any device, offer a centralized library for efficient storage, automatically transcode recordings for on-demand playback on any device, and index the video content so it can be searched for and found by your team at a later date. Likewise, where video conferencing tools are strong, video portals can further help them flex their muscle. 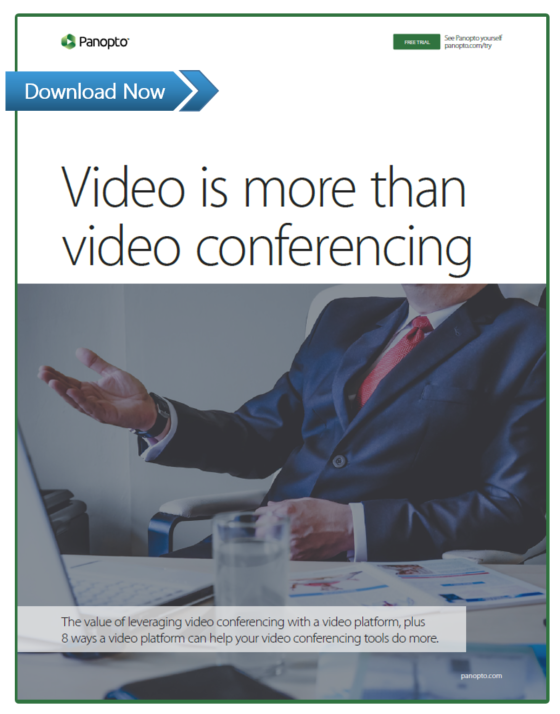 Modern video platforms can enable organizations to scale meetings held via video conference to thousands or tens of thousands of viewers — far more than video conference technology could otherwise allow. And because they make it easy to record and store video, video platforms can make it possible to record important meetings and save them for future reference in a central library. A video platform provides your organization with the tools needed to drive more value out of your investment in video. Video is way more than video conferencing. Find out more, including five ways a video platform can help maximize your investment in video and practical recommendations for enterprise video from the industry leaders like Gartner, Forrester, Siemens, Microsoft, and more in our latest white paper.